WILLIAMSBURG, Ohio — Support is continuing to pour in for Clermont County Sheriff's Detective Bill Brewer, who was killed in the line of duty during a 12-hour standoff. Brewer was a 1996 graduate of Williamsburg High School, making a name for himself as a standout athlete. On Saturday, Williamsburg Local School District organized a spaghetti dinner to raise money for Det. Brewer's family. Superintendent Matt Earley said everyone in the community has been asking how they can help his family. So they decided to organize an event to raise funds and provide a way for the residents to give back to the civil servant who gave his life protecting the community. "We've got a hero here," said Earley. "Detective Brewer is a hero. His brothers and sisters in law enforcement, first responders, firefighters, paramedics -- they deserve our gratitude every day, and it's the least we can do." Det. Brewer leaves behind a wife and five-year-old son. The outpouring of support for the fallen officer was proudly on display as hundreds stood in the cold to say goodbye during his funeral and procession Friday, and the support is still strong as hundreds packed into Williamsburg High School Saturday night. "Turnout has been exceeding our expectations to this point," said Earley. "We're already close to 300 served in the first hour and a half. Which is stellar, but it's not surprising. We're a small town with a big heart." 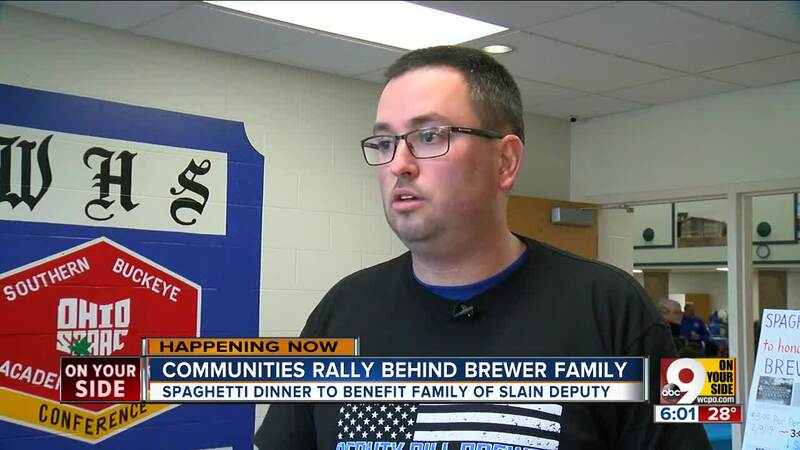 For others in the community who could not attend, there are still opportunities to show support for Brewer's family.